April 4, 2018, © Leeham News: The Trump Administration’s ill-conceived proposed tariffs on aircraft parts made and imported from China prompted what on the surface appears to be a hit back at Boeing, but which in reality seems more fluff than substance. Jon Ostrower broke the news yesterday about the list of aircraft components Trump proposes tariffs on. Since Boeing uses China for some of its aircraft components, the tariffs would hurt Boeing. China today proposed 25% tariffs on Boeing airplanes—but excludes the MAX 8 by weight. (The MAX 7 may be included, with between 10-20 announced ordered by two Chinese airlines). According to Airfinance Journal Fleet Tracker, there are only 19 737-800s remaining on order for delivery this year through 2021. This doesn’t include any Unidentified orders. Eight -800s are scheduled for delivery this year, six in 2019, two in 2020 and three in 2021. US aerospace analysts are unimpressed. The following is a synopsis of their reaction. Trade War Heats Up: We are buyers of Boeing and related suppliers on weakness resulting from the overnight news that China will impose a 25% import tariff on certain U.S. aircraft. However, the proposed scope for the tariffs appears to intentionally avoid the meat of U.S aircraft exports to China, suggesting to us that this is more of a warning rather than a quid pro quo response. China’s reasoning may be that its aircraft requirements are difficult to source elsewhere, especially for those Chinese airline fleets that are already wed to Boeing rather than Airbus or another OEM (see our note from March 23: Trade Wars: Return of the Tariffs.) Shares of Boeing (as much as 4.5% intraday) and most aerospace suppliers have responded negatively as expected, and this market reaction may be the real intended effect of the aircraft tariffs. We think that both sides are rattling sabers in an effort to jumpstart serious trade talks that may ultimately result in a much more measured, negotiated outcome with minimal damage to U.S. aircraft exports to China, since these are products that are more difficult to source elsewhere. The proposed tariffs specifically target aircraft between 15k-45k kgs. Assuming this refers to aircraft operating empty weight (OEW), this is actually a fairly benign range for Boeing. Importantly, all Boeing twin-aisle (widebody) have an OEW well-above the target range, as do all variants of Boeing’s newest narrowbody, the 737MAX. Those aircraft that would seem to be targeted are the legacy 737NG models, the -700 through -900. China proposed a 25% tariff on aircraft weighing between 15,000 and 45,000 kgs in response to US trade actions against the country. As of this writing, aero stocks in our coverage are trading lower by 1-3% due to concerns that Boeing (and the supply chain) will not be spared from the escalating trade war. We understand some big picture concern but it appears to us that the specific proposals from China this morning are calibrated carefully to avoid a major impact on Boeing and are therefore intended more as a message to the US administration that additional trade barriers will be met with an escalating response. In other words, this looks like a shot across the bow with regard to Boeing and our base case remains that we will see little change in Boeing aircraft deliveries into China. Tariffs could apply to 737 NGs; MAX 8 appears exempt. Based on Operating Empty Weight (OEW) specs from Boeing, the 737 MAX 8 should weigh 45,070 kgs putting it just above the threshold for the tariff. 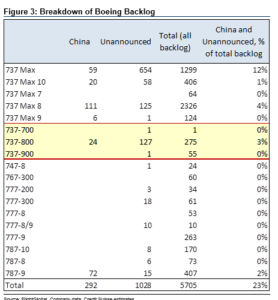 The current generation 737 NGs, of which there are ~375 remaining in backlog according to Ascend, weigh less and fall into the scope of the tariffs. Boeing will stop building 737 NGs in 2019-20, however, so it doesn’t matter if Chinese carriers don’t order them . . . they weren’t going to anyway. Moreover, it is not clear whether the tariffs apply to aircraft already under order and if not, they shouldn’t really affect any NGs. Finally, with Chinese NG deliveries concentrated in 2018-19, there are no other options for Chinese carriers to get planes in this timeframe with Airbus sold out. 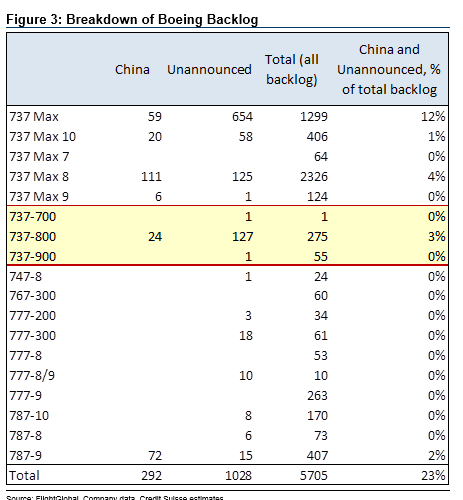 In fact, Chinese carriers have likely been making pre-delivery payments on some of these 737 NGs already. 737 MAX and widebody jets are spared for now. The future of Boeing’s commercial aviation families appear to have been excluded from the tariffs. We would note that China has an interest in the 737 MAX program, which its airlines are relying on for their expansion plans and Boeing is setting up a completion center in Zhoushan. The proposed weight limits on commercial aircraft look to purposely single out the 737NG. The NG is Boeing’s current narrowbody offering that is transitioning to the new MAX variant over the next few years. This appears to limit the fundamental impact on earnings and cash and we think signals a purposeful intent on the part of the Chinese government to maximize headlines, while simultaneously leaving natural room open for negotiation. This implied “room for negotiation” also signals an expectation by the Chinese that Boeing can and will exert influence on the USG. This is a subtle point, but we think an important one as there must be an angle for the Chinese to selectively carve out only one subset (but an important subset) of BA’s business. However, whether Boeing can help deliver a more palatable solution is up for debate. With BA appearing closer to the White House than we can recall in many years, this is a dynamic that should be on investor’s radars. We see a ~5% impact to BA’s cumulative earnings through 2021, based on our read on current tariff proposals. There’s a natural desire to calculate what the maximum earnings impact may be. We currently see the fundamental impact as modest and that’s before considering that narrowbodies at both Boeing and Airbus are sold out into the early 2020s, making switching difficult for Chinese airlines that need the planes. However, given the fluid nature of this situation and the myriad of unknowns, we’re not sure exactly how helpful this analysis is; at this stage multiple contraction appears to be the bigger risk. In Aerospace, our general rule of thumb over the years is that a 10% free cash flow yield (or $300 for BA based on our 2020E FCF/share forecast of $30) is where you buy a stock aggressively if you believe the underlying cash flow forecast is largely intact. Boeing’s fundamentals and operational execution remain very strong – a 10% yield would be a steal based on what we know right now. If tariffs are limited to 737NGs, we’re getting very close to the level where sidelined investors will need to take a much closer look and we are not recommending that holders sell into this weakness. We’ll be monitoring for second and third derivative impacts on global growth and air travel. Although these do not appear material yet, they would be more fundamentally impactful over time than a loss of some % of last-of-line 737NGs. This cannot be helpful to an EMB / Boeing alliance since the E-Jet’s are in the proposed tariff sweet spot? Unfortunately guess what other planes are in the sweet spot? The soon to be Airbus C-series. E-jets assembled at Aeródromo Embraer – Gavião Peixoto: Not eligible for Chinese tariffs. Mirabel-assembled CSeries: Not eligible for Chinese tariffs. Mobile-assembled CSeries: Probably eligible for Chinese tariffs. BTW, why would Airbus/Bombardier deliver China-bound CSeries jets that would be assembled in Mobile rather than at the current CSeries FAL in Mirabel? So 25% tariff on the all the NG models and presumably the Max-7 as well (the Max-8 is 45,070kg OEW, surly the Max-7 is 71kg lighter). This seems to hit all the Boeing aircraft competing with the C919. Available info for the Comac C919 gives ’empty weight ‘ of 42,100kg. The big picture aspect is the inanity behind all this. There certainly issues to be discussed but this is not the way to do it. Exactly what way is that? Decades of talk have left us in an intolerable situation with China’s theft and dumping. Everybody complains about China but when we confront them with tactics they understand people throw tantrums. My guess would be you have to move away from your subjective hurt to understand the issues. China does not really dump on the US. The US (corporations) exported manufacturing to increase profits at home. The US pushed for global free trade as that advantages the biggest market participant ( at the time the US ). Moving jobs abroad hacked away at “biggest market participant”. Now the same entities are screaming that free trade is unfair. This is really hilarious in a very sad way. Mathis: Rome was not built in a day and it did not fall in a day. Nothing wrong with dealing with it, we saw how well ripping things apart worked in Iraq. Chaos followed. Have a plan, a strategy and follow it. Random tacks of tweets is beyond belief. And you might look at who shucked those jobs willingly over seas as well. Or where the tweeter gets his junk made? Topple the whole system over a tantrum. It aint’ the tweeter that will pay the price. Anyone who supports Trump’s “policy” need their heads examined. His “trade wars are easy to win” is something I believe I heard when I was in 3rd grade…….from another 3rd grader. 3rd grade policy intellect for Trump? Checks out. Many companies are moving production home from China or move it to Vietnam. You’re both right. And this long term policy as such has mostly benefited the upper crust of the food chain on both sides of the Pacific. This is easy. You ( and some select posters ) invariably make the same errors. Calling this a “tantrum” would more appropriately describe the anti-Trump opposition. Too bad more people can’t be like Scott whom while obviously not agreeing with most of his policies but stays rational and doesn’t resort to silly name calling. It’s unclear at this time if the specifically target aircraft between 15,000 kg and 45,000 kg refers to Manufacturer’s Weight Empty (MWE) or Operating Weight Empty (OWE). If it is the former, the proposed 25 percent tariffs would include the MAX 8 by weight — i.e. MAX-8 OWE is 45,070 kg; with MAX-8 MWE < MAX-8 OWE. Interesting point. Boeing sells aircraft without cabin fit which will make the MAX8 <45T. But what stops China to change it to 50T ? They can but why would they? To protect a stretch or HGW variant of the C919. The 45.057T includes cabin fit in typical layout, the manufactured weight is less than that. It has been my view that it will be in widebody where Airbus has slots that we will see Boeing suffer. China Southern is making those noises. I am from New Zealand but understand well the theft of technology. The response is not smart. Does anything on the US tariff parts list affect Boeing? Looks to me like BA escapes. If this keeps growing though a 737 FAL in China might be the result. It seems this was simply to nick them more than a full on assault. 737-7s and 737 NGs would be affected. Not a big deal. China really can’t afford to really hurt Boeing. The 737-8 is 45070kg and so above the 45000 limit. What happens when BA or CFM want to lighten it? 70kg doesn’t leave them much room for improvements. Will BA have to make a special China model, less competative against Chinese models, inc A320, or will they forgo weight reductions all together? Or will China push BA into a local FAL? 737 replacement should be well under 45000kg, so if this goes on, and Trump wins a second term, what them? It should also be noted that the big imbalance in US China trade means that overall US has less to lose, so the next US president might not back down either, from a national point of view there is not much reason to. Call it the China nose weight. Better run down to the patent office ASAP, or someone else will. They can also fit extra fuel tank or reinforce the structure to increase the MTOW which would also resulted in increase in empty weight? My take is that the US wants to force the parties to talks because any deal to remove trade sanctions will see the Chinese make concessions. For the opposite reason, China wants to get its retaliation in early and hard to head off the sanctions being applied in the first place, so there is nothing to discuss. You have to look at it from China’s perspective. They seem to play the delay for time game nearly by habit. They will expect the US to do the same. By leaving BA with no room to improve its most popular model, and seeing how close Chicago are to Trump, they are saying “this is your run away elephant, and you have two years to control it before it will start to hurt you.” We might think two or three years to be a long time. The Chinese don’t. I’m not sure Xi is willing to damage the Chinese economy for years. He is under pressure to keep that economy growing and civil unrest at a minimum and a drawn out trade war will derail that. Xi is permanent top dog right now but he knows nothing is permanent there. A warning shot, but I think he is also telling us that this won’t be solved soon. I have confidence that this is the tariff that would be imposed on Boeing aircraft IF this nonsense does not escalate. But knowing the personality concerned it would be wise to assume that escalation will occur making all calculations based on the announced tariff meaningless. Yep, no thought process behind it. No plan. You know what they say about assuming… Especially when you could not possibly know what’s going on behind the scenes. So the US didnt announce tariffs on Chinese goods while Obama was President ? This is the first time that trade sanctions were announced by the President instead of the US trade representative or other cabinet official that has deep knowledge on the subject. This is the first time trade sanctions were announced without 1) a specific complaint about a specific country and an affected US industry or product and that complaint complies with WTO rules and 2) a specific remedy that complies with WTO rules. This is the first time the US has violated the WTO processes the US seeks to impose on the rest of the world. When Boeing is mere weeks away winning its trade complaint against Airbus, it does not look good that the US no longer is interested in being subject to WTO jurisdiction. Senator Sasse thinks its just one person. Why assume OEW and not MEW. MEW of the 737-8 should be below 45,000 kg. C-series is from Canada, not USA, should not be affected. Cseries hasnt even been ordered by China. Maybe these tariffs have improved its chances instead of max 7s ? That big pieces of the CS will, one day, be made in China won’t be fogotten by the Chinese either. These analysts forget that China is not a capitalistic country. The effect of tariffs in China will be every different than between, for example, Canada and the US (Cseries). In the case of tariffs on aircraft imported from Canada, the tariffs made the aircraft more expensive for Delta and other customers, changing the competitive landscape. In other words, Delta would have to pay not only Bombardier for the aircraft, but also tariffs to the US government, thus making it more attractive to instead buy aircraft from Airbus, Boeing or Embraer. Tariffs on imports to China would not create the same effect, because it is the government that is importing aircraft to its own airlines. It would just be an accounting exercise, where the tariffs are “paid” from one government department (transportation/acquisition) to another government department (taxes, subsidies and finances). The acquisition cost for China would be the same, tariffs or no tariffs. If China really wants to hurt the US government, it needs export tariffs (not tariffs on imports) on products that US companies have difficulty of sourcing from another supplier/manufacture. Expect pricing for stuff that uses rare earth metals to go up? The US has enough but shys the investment to produce them from local resources. Exactly right Meg; which is why Boeing can be hurt by a trade war even if there are no tariffs on Boeing jets. China just has to cancel a few widebody orders from Boeing and place them with Airbus to make an impact. Meg – the aircraft tariffs also hits the larger business jets. Those are not bought by the government but rather by wealthy individuals. So this will clearly hurt Gulfstream (and help BBD). Maybe now is the time for Taiwan to order 5 P8s, and option another five? As crews are excluded, it will definitely be less than the OEW weight, and seats doesn’t seems to be something that can consider as permanently installed either. But as it said normal flying condition, maybe fluids necessary for aircraft operation would be counted? Then the weight they are measuring would be somewhere between MEW and OEW and it seems like 737MAX8 will fall below 45000kg when counting this way.